Teaching With Love and Laughter: Ocean Unit Activities, a Freebie, and a Giveaway! My first graders have really been enjoying our under the sea adventures! There's so much to learn and so many exciting activities to do. What I love most about this topic is that the children can learn so much on their own, by reading nonfiction books and articles. I paired them up and gave each pair a nonfiction dolphin or shark book and they filled out their own tree maps. We also completed a 3-2-1 Nonfiction Reading Strategy Graphic Organizer. First, I modeled how to complete the graphic organizer. Then, the children completed one at a station. Being able to read informational texts effectively is a fundamental quality of successful readers. 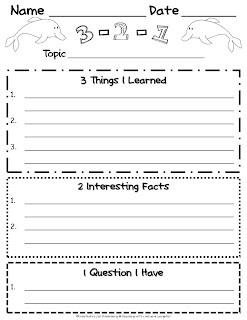 After reading nonfiction books or articles, this graphic organizer helps the children summarize what they have learned. You can click either image to get a copy for yourself. If you download it, please leave me some feedback at my store. Thanks so very much! Here is a picture of one of my ocean display tables (before the children had at it!) It doesn't stay so neat looking for very long! I hope that you all enjoy your week! I love that you let the kids come up with their facts - what great independent practice! It's amazing how much more interested they are in reading and writing and learning when they can choose their own materials and be in charge of finding their own facts. I love their excitement! Love the ocean display - it's so cute! I'm digging the 3-2-1 activity. So cool! Thanks so much, Sara and Jen! It's so important for students to be able to manaage all of the information in informational texts. I love the activities that you had them do- the tree maps and 3-2-1 reading strategy! Thanks so much, Lori! Even my lower students have been successful. Love the idea of your display table!! I usually scatter the theme around the room, but it totally makes sense to put it in one central location! Looks amazing, Lori! We are studying the Ocean now too! The kids really love the unit so far. Happy (almost) Friday! Thanks, Jessica and Alessia! We're having tons of fun! That's too bad because a lot of it was yours! LOL! Thanks again, Cara! I love the idea of the tree map in pocket charts!! Thanks for the freebie! I love your display table! Be sure to come by and pick up my freebies. Thanks for the freebie! It looks great. I LOVE the pocket chart tree map! I really like your 3,2,1 activity. It's perfect for my second graders. Your give away looks pretty awesome too. . . Maybe I can win that too. Then I'd be as happy as a clam! Nice blog. I'd love to teach more about oceans. Hoping that with the move to common core I'll have more time.